Eighty bags filled with rich soil and vegetable seeds currently line the cement wall inside Amrita Vidyalayam, an elementary and secondary learning institution created by Mata Amritanandamayi in Kerala, India. Although somewhat simple in appearance, these bags are the product of collectively eighty hours of passionate finding, folding, lifting, mixing, filling, planning, transporting and most importantly, Divine Grace. The process began on August 19, 2008 when eighteen individuals, aged 18-30, set out on an ecological mission: to introduce organic farming techniques to schoolchildren and in doing so, help mitigate the detrimental effects of global warming. This diverse and dedicated group, consisting of youth representatives from Spain, Germany, France, India, and the United States, was led by Cal Berkeley graduate and environmental activist Kusuma Venkatesh. The project stemmed from Amma’s request that someone find a means of spreading the knowledge of organic gardening. As soon as the AYUDH members heard about this idea, they immediately went to work. The first step was to locate empty sand bags, which could be used as planting vessels. Eighteen youth divided up locations to search and by the end of the day, 80 sand bags lay stacked up. The following day twelve group members set out to dig up fertile soil, which was hidden in a weed-covered plot of land just outside of the M.A. Headquaters. Using two gardening hoes and their bare hands, the kids began scooping up fistfuls of beautiful, organic soil which consisted of composted coconut shells. Each bag was filled about ¾ full, each one weighing 30 pounds, and was later transported in a lorry to Amrita Vidyalayam. Altogether, the 80 bags of soil weighed in at one and a half tons, not including the red soil and sand that would be mixed in at the school the following day. The next day, the youth took a bus to the school. There, the bags were emptied onto the ground of the school yard so that red soil and sand, which were brought from surrounding areas, could be mixed in. These two extra components were crucial in creating a healthy environment for the tiny seedlings. Once the three soils were thoroughly mixed and put back into the bags, the kids loaded the bus once more to return to the Ashram. The next step in the planting process was the most rewarding by far. Sixteen AYUDH members, including representatives from France, Spain, U.S., Germany and India, took a bus once again to Amrita Vidyalayam for the actual planting with the students. As soon as they reached the school, 80 eager eighth graders came pouring out of the school building and lined up before the AYUDH members. The students were divided up into groups of ten with two AYUDH members for each group. The students immediately dived right into the planting procedure. There was so much laughter and so many smiles coming from everywhere. Students were learning to use farming tools for the first time and they seemed to truly enjoy working with Nature. The girl students were slightly hesitant at first but as time went on and they witnessed the female AYUDH members digging with their hands, the girls giggled and eagerly participated in the process. The students learned the value of planting organically and they went home with a knowledge of how, where, and when to plant vegetables and other plants. At the end of the day each volunteer boarded the Amrita Vidyalayam school bus, exhausted, sun-burnt, sweaty, and grinning from ear to ear. I believe I can speak for everyone when I say that this experience was one of the most fulfilling and gratifying endeavors I have had the privilege to be involved in and I hope to see more projects like this one in the near future. Thanks for sharing this !! 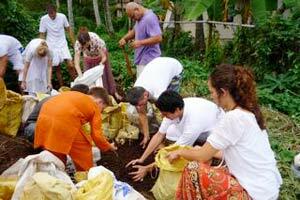 Wonderful seva, we need return to organic cultivation and the earth needs it too. I have really enjoyed reading this ! It was great, we had a lot of fun and worms!! Next Post Q86: Email addresses?